Portfolio Management | EuroRisk Systems Ltd. Scenario projection – portfolio theoretical value development over time. Provides means to define different strategies for scenario changes in the market environment in order to compose real world scenarios, such as crisis, growth, market shocks, issuer defaults, refinancing costs, etc. Performs the optimisation of risk and return, and presents proposals for portfolio restructuring in the presence of different scenarios, user defined restrictions and preferences. For example, investments in EUR > 30% and investments in USD < 40%. Enables the grouping of positions according to different parameters and compares specific aggregates against target limits. This enables continuous tracking of the portfolio’s current state and alerts in case of broken limits. A limit example: all positions in EUR must have a present value that is below 5 Mio. EUR and the three biggest positions in USD should not allocate more than 30% of the total investments in USD. Position and portfolio performance is calculated for a specific historical period and includes transactions. The performance is separated into realised, non-realised and FX-effects, which are aggregated along the sub-portfolio hierarchy. In addition, performances can be tracked against multi-level benchmark. Setting of investment objectives: time horizon, risk tolerance, income needs, liquidity requirements. Developing an asset allocation strategy. The portfolio is a set of specific types of objects (e.g. positions) that can be defined, using predefined lists, filters or both. Within a portfolio, hierarchical dependencies between sub-portfolios can be defined, using predefined structures, that are based on the portfolio content (e.g. according to currencies in the portfolio). Lists, filters and structures define the portfolio’s asset allocation. Models working with portfolios, lists, filters, and structures require the registration of these objects in a catalogue, according to the object type. Evaluating the selected investment schema. Reporting locally in different formats, e.g. Excel, Crystal report, OLAP reporting and QlikView. Portfolio reviewing process, answering questions on whether the portfolio meets the selected set of objectives or performs consistently with predefined expectations. 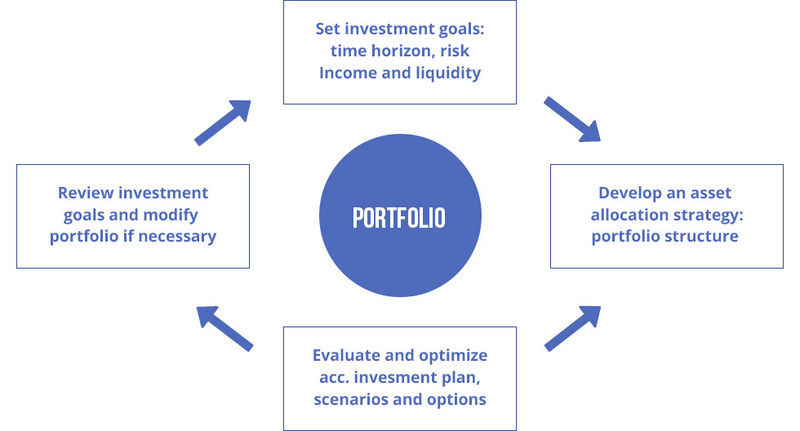 A portfolio’s investment objectives can be reviewed and modified as needed. Multi-level portfolio (re)structuring based on calculation results and position properties. Allocation of positions, e.g. by currencies and maturity bands. Static and dynamic portfolio structuring. All evaluations are performed according to a selected market scenario. Results are aggregated on every level of the portfolio structure. Multiple market scenarios are applicable and can be compared at all levels. Market and theoretical values, Profit / Loss. Market and paid prices at the beginning and the end of a historical period. Accrued interests at the beginning and the end of a historical period. Capital and interest rate payments within a historical period. Fees and taxes within a historical period. The Portfolio Management Module inherits the features of Risk Framework Interfaces and Connectors and Risk Engine Interfaces and Connectors.